Let me make this perfectly clear. 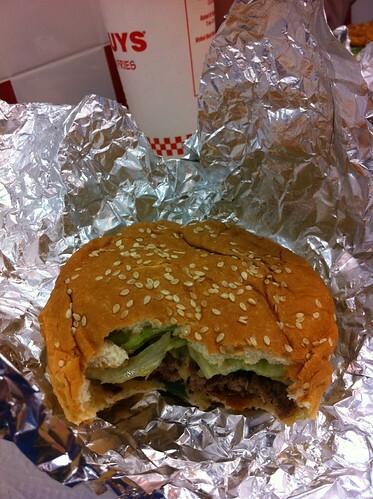 I am not saying that "5 Guys" burgers are better than IN N OUT's. I am saying that, on occasion, I will grab a burger and fries from there when I'm craving a few jalapenos and some A1 sauce. Today happened to be one of those days. A new joint just popped up across the street from work on Candlewood in Lakewood (the city just south of Downey) and people were showing up with it all day for their lunch breaks. Needless to say I got a craving for it so, after work, I headed over. I never thought I'd see the day you'd admit to craving a non-In-n-Out hamburger!